Cold and flu season always seems to drag on and on, doesn’t it? Depending on where you live, this season of increased sickness can begin around mid-November and last all the way to March and sometimes even April. Yes. Cold and flu season can last between 5-6 months. I know. It’s a bummer. We’ve been lucky this year and no one in our family has been hit by a nasty flu virus, but we have seen our share of colds in the little ones that seemed to never end. The coughing, the runny nose, the headaches, the whining, the on again off again fevers. All of it. Here two weeks, gone a week, back for another two. It’s exhausting! Maybe you’ve had some of those in your house this winter and you know exactly what I’m talking about. 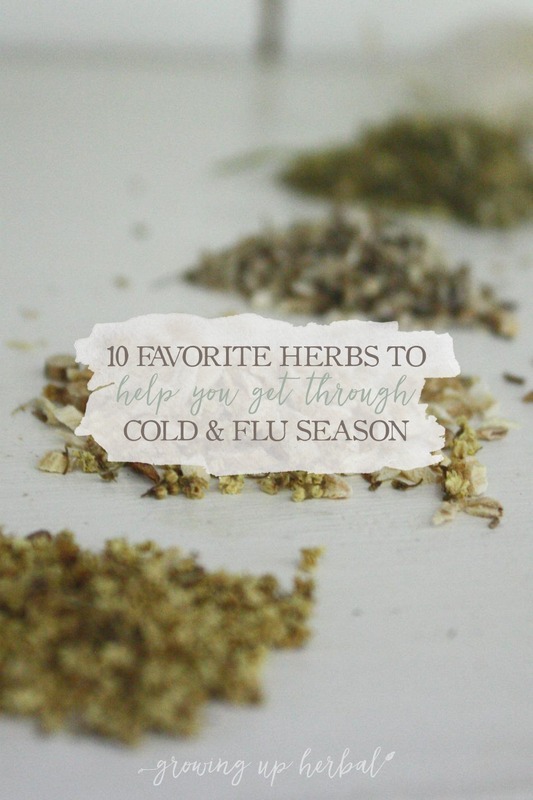 Now whether you have or haven’t dealt with a cold or the flu already this season, it’s time to gather up your herbs and put them to good use in case you need them, mama. 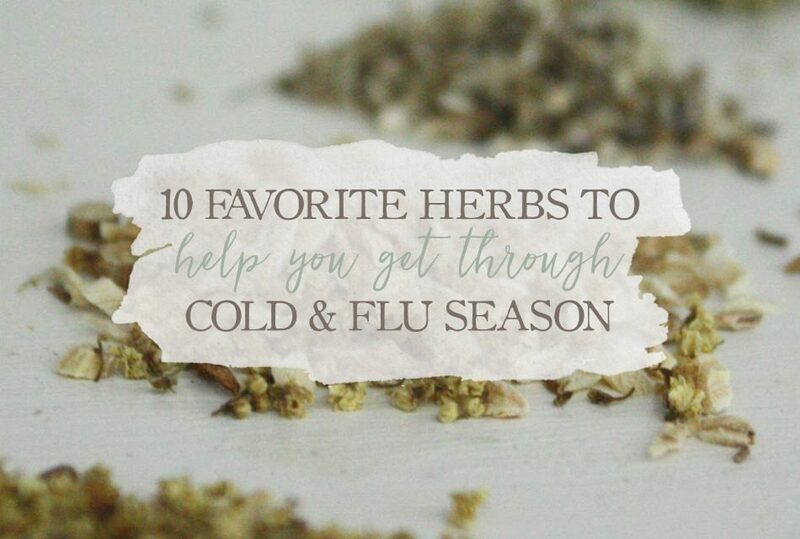 Today, I’m sharing 10 of my favorite herbs to help you get through cold & flu season as well as a few ways to use each one. I use echinacea root in two different ways during cold and flu season. One, as an immune stimulant, and two, to discourage and rid the body of infection. First, I take echinacea at the as soon as an illness seems to be setting in. I’m talking LARGE doses of it during the first 24 hours of feeling yucky. It’s not that my immune system isn’t working and needs me to wake it up. It’s always working. 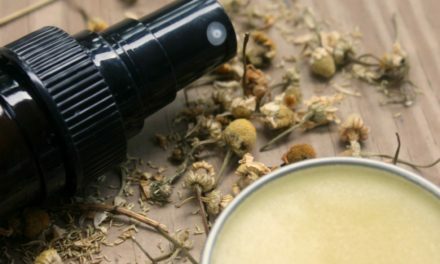 It’s just that enough studies have shown that taking immune stimulating (boosting) herbs can help to cut down on the time you are sick or how sick you actually are so I find that it’s valuable. Next, if I think I’m getting a sinus infection from a cold, echinacea is one of my go-to herbs to keep the infection from getting worse. Echinacea has antibacterial properties and has been used for hundreds of years to manage active infections so they don’t get the better of you. I’ll talk more about how I manage potential sinus infections from colds a little later on in this post. You can find echinacea root online here. Some form of elder can always be found in my house. I harvest the flowers and some leaves every year during the summer, and I stock up on the berries in early fall because I know many of the local and online shops will be out of stock when cold and flu season arrives. Elderberry is a famous antiviral herb, and this is the time of the year when it seems these viruses are running rampant. I suppose most viruses (not all) prefer cooler weather. t works to strengthen the walls of cells in order to inhibit viral penetration, it inhibits viral replication within cells, and it’s high in vitamin c which aids the immune system. Elderberry works to strengthen the walls of cells in order to inhibit viral penetration, it inhibits viral replication within cells, and it’s high in vitamin c which aids the immune system. You can add them to teas, syrups, and tinctures. Elder flower is a commonly used diaphoretic herb which means it opens the pores of the body and allows heat to escape. It’s most often used with other herbs to help lower fevers naturally, but it’s also used to help calm the nerves and relax the body. You can find elderberry online here and dried elder flower online here. Ginger is one of those herbs that can be used all throughout the year, but cold weather is my personal favorite time to use it because of its energetic qualities. It’s a warm, diffusive herb. It heats your body up and gets your blood pumping. It unblocks stagnant, dormant areas of the body, and increases energy flow. I don’t know about you, but summer is not the time I think about ginger. When it comes to using ginger during cold and flu season, my favorite way to use it is as a tea. I prefer teas with ginger for a few reasons. First, ginger is strong and spicy tasting, and if I take it as a tincture, it’s a bit too much. I like to sit and sip on it and let it slowly warm me up. It’s funny. You can actually feel the effects of ginger move from your mouth down into the rest of your body. It’s a really cool sensation. Next, when I’m feeling sick, I want that constant warm feeling, and sipping on ginger tea helps me achieve that. Not only does it keep me feeling warm and cozy, but it is stimulating to my mind as well as my circulatory system. Lastly, I love the smell of fresh ginger. When you grate ginger up and let it steep in a cup of hot water, it helps to release all those volatile oils in the plant material. Then, when you sipping your warm tea, you can take deep breaths of it and let it make your mind happy too! SUGGESTED REMEDY: Lemon ginger tea. I recommend purchasing and using fresh ginger root, but you can use dried root in a pinch (especially for tinctures). Astragalus is a nutritive herb and is considered by some herbalists to be an adaptogen. Adaptogens help the body handle stress by bringing balance to the endocrine system… specifically the adrenal glands which can be very beneficial during times of illness. Honestly, I don’t know enough about adaptogens to really explain their action in the body, but that is on my “herbal education to-do list.” I mostly use astragalus in immune boosting formulas and as a food. My favorite way to use it is to include it in homemade chicken broth or beef broth during the cold winter months. Chicken broth made from healthy chickens is already great for the body, but adding some astragalus root to it is even better! SUGGESTED REMEDY: Astragalus chicken broth. You can find astragalus online here. Garlic is definitely one of my go-to herbs for everything really, but especially during cold and flu season. Garlic has a chemical called allicin that gives it its antibacterial properties, and it has been used throughout the ages to overcome infections or discourage infections from starting in the first place. It also has antiviral and antifungal properties, and it’s a great herb to have on hand for use during cold and flu season. I use a lot of garlic in the foods I cook at home, but we also use garlic remedies. Two of my favorite garlic remedies are GOOT (you can find the recipe in my – Making Herbal Ointments, Salves, and Balms: The Ultimate How To Guide) and garlic syrup. We use GOOT externally and garlic syrup internally when my kids get nasty chest colds. You see, I don’t want all that crud in their lungs to lead to bronchitis or pneumonia so I like to do what I can to keep that from happening. Garlic helps me do that. I recommend purchasing and using fresh garlic cloves. Usnea is my new herb love, and I plan on getting to know this wild-looking thing really well this year. Usnea is a tree lichen that, you guessed it… grows on trees! It’s a combination of algae and fungus that has been used historically for respiratory infections such as pneumonia and tuburculosis. I recently used usnea to help my kids through the seemingly neverending cough they had, and I’m happy to report they all got through it without developing any sort of infection even though many other little ones their age were coming down with them. You can find usnea online here. Yarrow is another great herb for cold and flu season. Like echinacea, it’s often used at the first sign of an illness to stimulate the immune system. Unfortunately, it’s stimulating action isn’t thought to be as strong as echinacea is. I like to use it along with elder flower in my fever tea blend because yarrow is a diaphoretic herb (like elder flower) and helps the pores open up so heat can escape the body. This helps to gently lower a fever so my kids don’t feel miserable without taking the fever away entirely as the body needs it to fight off the bacteria or virus it’s fighting. You can find yarrow online here. It never fails that anytime I happen to come down with a cold that seems to get stuck in my head I feel like I’m getting a sinus infection. My head gets all stopped up. I can’t breathe. I get a headache. There’s a ton of pressure around my eyes. It’s miserable. That’s where olive leaf comes into play. Yes, olive leaf. The leaves from the tree that produce the salty, sour olives we eat on pizza and salads. Olive leaf is one of the herbs in the sinus rinse blend that I use in my neti pot. Olive leaf contains a chemical called oleuropein that has been shown to kill bacteria and fungi which can really help if you think you’re getting an infection. They’re also very astringent so they help to tighten the tissues of the nasal cavities up with helps to decrease inflammation and slow mucous production. SUGGESTED REMEDY: Herbal sinus rinse. You can find olive leaf online here. When too much coughing or sinus drainage causes a sore throat, marshmallow root is my go to herb. When diarrhea comes to our house (which isn’t often, thank goodness), I reach for marshmallow root. Marshmallow root is demulcent which means when it’s combined with water it produces a soft, slippery goo that helps to moisturize dry, hot tissues. It can be used in a lot of different ways, but when it comes to using it for cold and flu season, my favorite way to use it is by sipping on a honey sweetened marshmallow root infusion, especially if I’ve been coughing a lot. It works well to cool and moisten my throat, but it’s an easy remedy to take as it has a mild, sweet flavor. SUGGESTED REMEDY: Honey sweetened marshmallow root infusion. You can find marshmallow root online here. What comes to mind when you think of wild cherry bark? Probably the flavoring in many over-the-counter cough syrups, right? Well, the reason is because most cough syrups USED to be made from wild cherry bark because it acts as a sedative and can help suppress the urge to cough among other things. Now, the cherry founding OTC cough syrups isn’t real cherry bark. It’s a sugary cherry flavoring which has no health benefit whatsoever. Whenever I, or one of my kids, come down with a cough, wild cherry bark always ends up in the formula I mix up for us. I use it because it works to suppress the urge to cough, to loosen stuck mucus so you can cough it up (which suppresses the urge to cough in and of itself), to decrease mucous production, decreases inflammation, and open the lower airways. It’s good stuff folks! To keep it simple, I often make a wild cherry bark syrup for the kids. Wild cherry bark has a strong, bitter flavor to it so making it into a syrup really helps “the medicine go down,” especially in the case of this herbal medicine. SUGGESTED REMEDY: Simple wild cherry bark syrup (coming soon). You can find wild cherry bark online here. What about you? What are your favorite herbs to help you through cold & flu season? Share with me in the comments below! 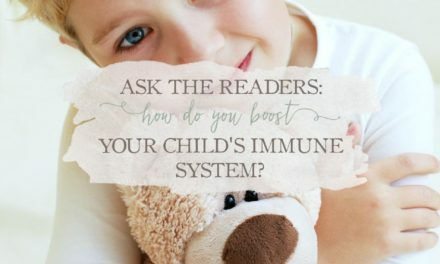 Ask The Readers: How Do You Boost Your Child’s Immune System? Thank you for all your educational advice on herbal treatments…..recipes….and testimonials…..I am a true believer in elderberry….for 20 years I have been experiencing attacks of shingles….I had them once or twice a year…each time more severe….My doctor had the shingle vaccine prescribed but I couldn’t be shingle free for a year and be allowed to take it….now I’m thankful for that because I heard about elderberry….started taking supplements and drinking the juice…added 100 B complex….and 1000 mg. Lysine….I’m so thankful to say my shingle attacks have ceased….I only had a slight break out 2 years ago when I had a hip replacement….I’m a believer and user of herbal medicine….we also use them on our cats and dog as well…..wonderful gifts of nature from the Lord….I will be forever grateful…please continue your work on teaching of herbs and their gathering and preparation…. Thanks for sharing your story Donna! I love hearing how well herbs work for people! Hi Megan, good to read about your preferential herbs for this time of year. I’m wondering while these are all things I’ll definitely be stocking up on, which one can my breast feeding partner use? Any tips would be great and even for baby too? From my understanding, everything on this list is safe during nursing and for littles (although most babies won’t like the taste of spicy herbs). 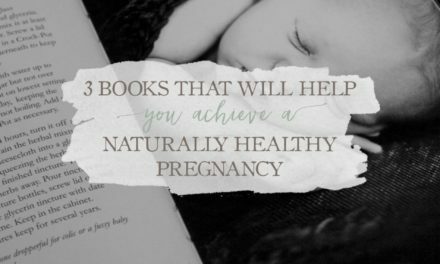 I have a link in this post to Earth Mama Angel Baby’s e-book on breastfeeding which has a list of herbs to avoid during nursing. Great question! Thanks for your comment! Thanks for all the good tips, I have tried various. On another note would you know what herb can help bring down cortisol levels at night? I’am having a hard time getting a deep sleep and wake up a lot. Thank you, God bless. Hi, Laney! I’m so very sorry for your troubles. Not getting sleep at night is NO FUN AT ALL! It makes you feel crazy as I’m sure you know. Anyway, I don’t work with adults or chronic conditions at this point so I’m going to recommend you talk with an herbalist that works with adults. If you wanna do research on your own, I’d recommend looking into herbs that are nourishing to the endocrine system like adaptogens. I have a powdered adaptogen blend here that I personally love (and my kids too). Adaptogens are tonics and can be taken long-term. As far as I know, the only herb to use caution with is the licorice root if you have high blood pressure or kidney disease as it can lead to water retention which will exacerbate those conditions. You can use it for 4 weeks, then take it out of the blend for 2 weeks before adding it back in. Again, I’d check with an herbalist or your doctor about using them. A doctor will be able to monitor your cortisol levels as you try different herbal protocols. Hope that helps! – all three are herbs that have thousands of years of use as both culinary and medicine. We take the honey at the first symptoms of a cold, and so far, it has worked great! Although I was able to avoid two colds with symptoms stopping after only two days, my husband’s did progress (he wasn’t taking the honey frequently enough), but we were able to shorten his illness with a fire-cider recipe. I love how well the simple foods-as-medicines work! Thanks for this comprehensive list. You’re welcome! I’m glad you’re finding success with herbs in your own family too. Thanks for sharing, and great job on your video, Michelle! Eck, the video was fun, but not the best. Thanks though Meagan, you and your work are an inspiration! I have just started experimenting with essential oils, and one of my questions,.. If there any thing that would help a person with GOUT??? Also I need the “Just Right Pain” rub for my muscle spasms in my neck.. If you could help me I would be grateful..
Hey, Patti. It would be a good idea for you to speak with an aromatherapist if you’re looking for EOs to use with GOUT. As far as the “Just Right Pain” rub goes… I’m not sure what you’re referring to. Can you explain?